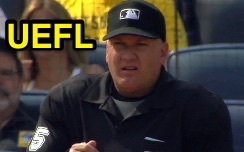 HP Umpire Jeff Nelson ejected Rockies pitcher Jorge De La Rosa for arguing ball calls in the bottom of the 7th inning of the Rockies-Pirates game. With none out and one on, Pirates batter Francisco Cervelli took a four pitches from De La Rosa for balls, resulting in a walk. Replays indicate all four pitches were properly officiated (the closest px value to the strike zone was 0.935), the call was correct. At the time of the ejection, the Rockies were leading, 5-0. The Rockies ultimately won the contest, 5-0. This is Jeff Nelson (45)'s second ejection of 2015. Jeff Nelson now has 9 points in the UEFL Standings (5 Previous + 2 MLB + 2 Correct Call = 9). Crew Chief Jeff Nelson now has 5 points in Crew Division (4 Previous + 1 Correct Call = 5). This is the 186th ejection of the 2015 MLB Regular Season. This is the 83rd player ejection of 2015. Prior to ejection, De La Rosa's line was 6.0 IP, 0 ER, BB, W.
This is the Rockies' 5th ejection of 2015, T-3rd in the NL West (SD 15; LAD 8; COL, SF 5; ARI 3). This is Jorge De La Rosa's first career MLB ejection. This is Jeff Nelson's first ejection since July 25, 2015 (Paul Molitor; QOC = Y [Check Swing]).